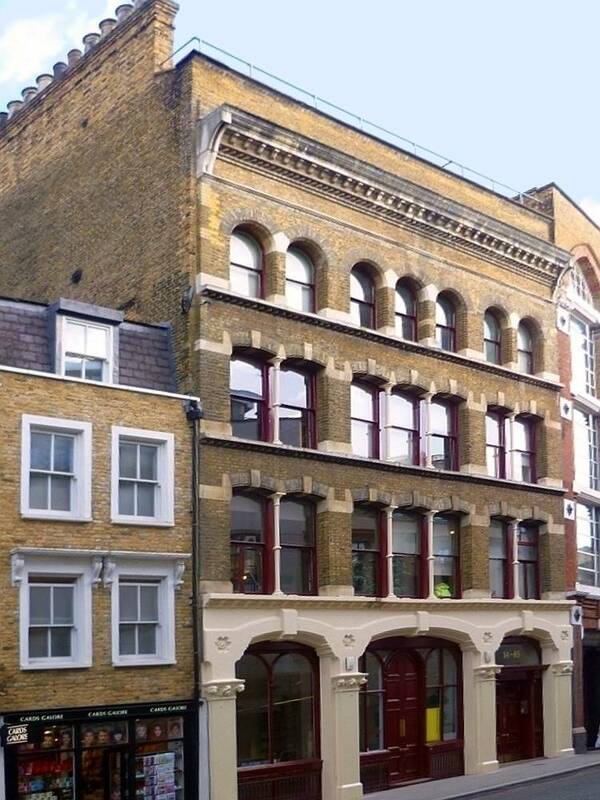 14-16 Cowcross Street, Islington, London EC1. Silvester Charles Capes (1825-1901). 1867. Listed Grade II. This substantial five-storey block (the top storey hidden behind the parapet), plus a basement, was built as workshops. 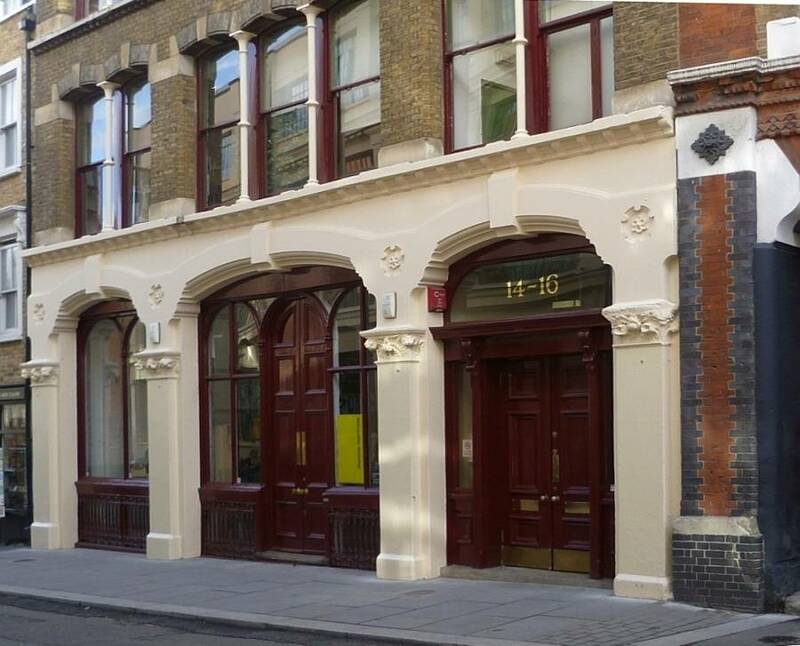 It has been described as an "attractive and well-maintained warehouse" (Temple), probably put up by a speculative developer wishing to capitalise on its closeness to the historic Farringdon Station. This was the terminus of the Metropolitan line, the very first underground railway in the world, which was opened with pomp and ceremony in 1863, and is reputed to have carried as many as 26,000 passengers a day in its first six months (White 45). The line had been extended only recently, in 1865 (see also "Farringdon Station"). Indeed, the whole area was being transformed at this time (see Cherry and Pevsner 627). The road itself is set on the gentle curve of this (now) "cherished thoroughfare," and "fronted in a vestigially Italianate commercial style, executed in yellow brick with stone dressings and cast-iron columns to the first- and second-floor windows [...]. The ground storey is exceptionally well preserved and includes ornamental iron guards to the basement windows" (Temple). It has a fine tall central doorway, too, as well as the one over which its street numbers are currently written. The frontage is distinguished by pilasters with carved foliage in the capitals, elegantly finished arches, and carved patterned roundels. Left: Detail of front elevation. Right: Seen from the other side. The building venture was clearly successful. According to the listing text, these premises were originally occupied by "druggists, sundriesmen, infants' milliners and artificial flower manufacturers." The interior arrangement suggests that it was always intended for a number of different trading concerns. It is "shallow, with the main floors divided laterally into three bays by means of cast-iron columns supporting timber beams. Relatively generous stairs for a building of this class" (Temple). The listing text adds that it remains largely unchanged inside: the "interior preserves the main and simple lines of the original building intact apart from enclosed spaces round the staircase." 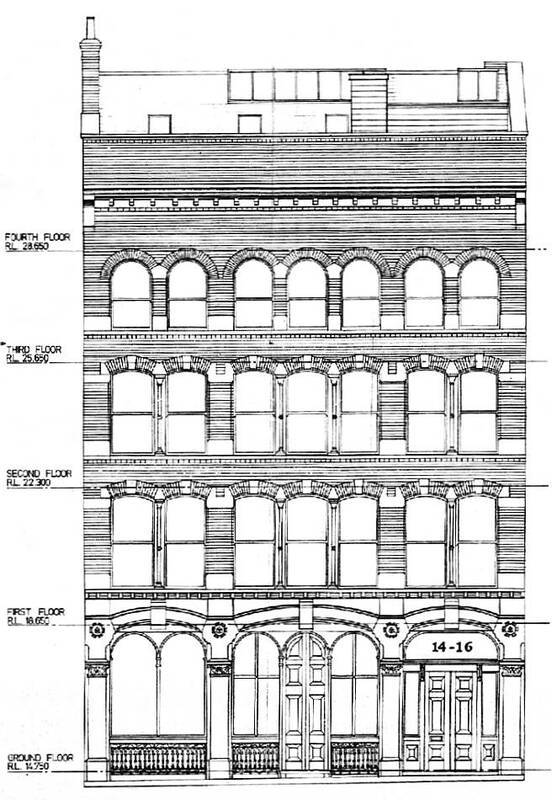 Front elevation, showing "the main and simple lines of the orignal building" (© Alan Baxter & Associates LLP). Compare this solid, dignified mid-Victorian building to the more flamboyant one nearby by E. W. Mountford, designed at the very end of the Victorian period for the offices of the Cowcross Distillery, owned by Booth's Gin. This had art panel reliefs by F. W. Pomeroy and was altogether more lavish. 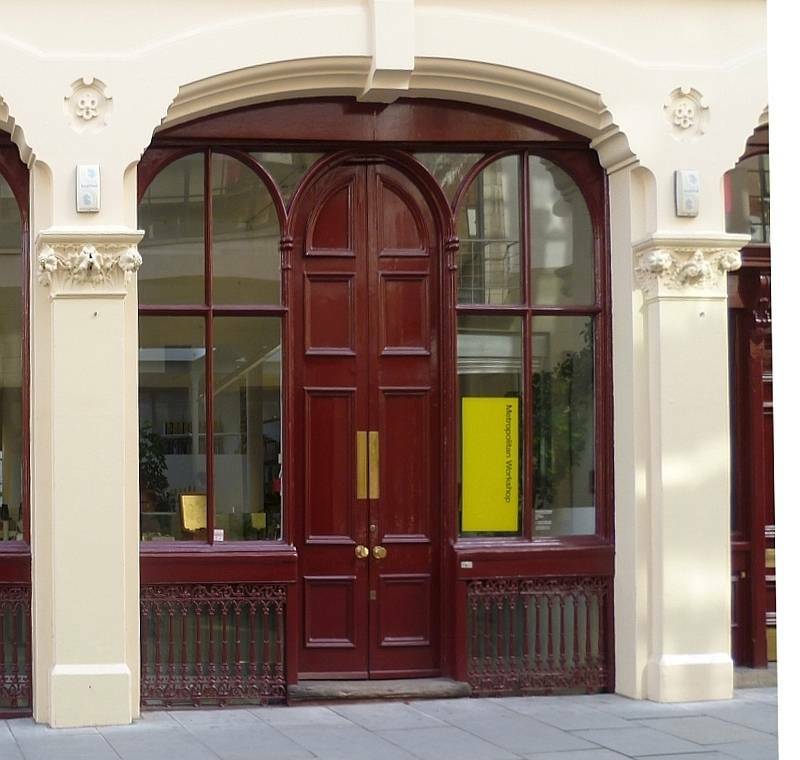 Its façade has since been rebuilt to the rear, in Britton Street, where it now serves as the frontage to flats, still rather inappropriately sporting Pomeroy's frieze depicting the stages of gin-production (see Cherry and Pevsner 626-27). Capes was not such a high-profile or adventurous architect. Bridget Cherry and Nikolaus Pevsner do not even name him as the architect of nos. 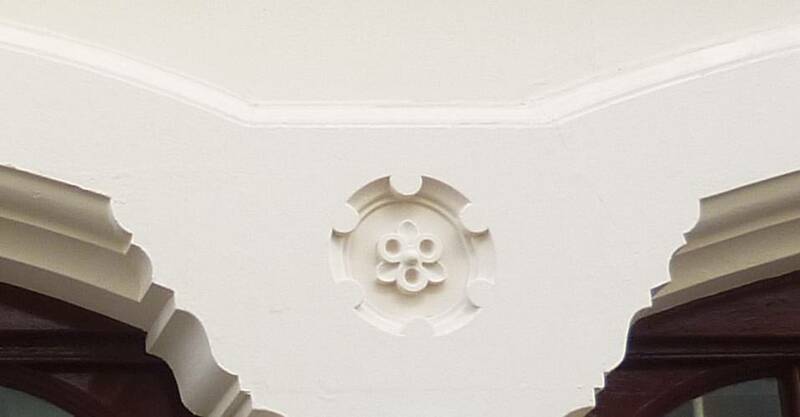 14-16, simply saying that the building is of a similar date to its neighbour, no. 18. Actually no. 18 was built about twenty years later. But it says something that Capes' building is not only still in use, but is currently occupied by an architectural practice. It has stood the test of time extremely well. Photographs, captions and commentary by Jacqueline Banerjee. You may use these images without prior permission for any scholarly or educational purpose as long as you link your document to this URL in a web document or cite the Victorian Web in a print one. Front elevation very kindly sent in by Alan Baxter & Associates LLP. Click on the images to enlarge them. "14-16, Cowcross Street, Islington." British Listed Buildings. Web. 4 January 2013. Cherry, Bridget, and Nikolaus Pevsner. London 4: North. The Buildings of England series. New Habven & London: Yale University Press, 2002. Print. "Farringdon Station." Our Transport Heritage. Web. 4 January 2013. Temple, Philip, ed. "Cowcross Street and Turnmill Street." Survey of London, Vol. 46: South and East Clerkenwell, 2008: 182-202. British History Online. Web. 4 January 2013. White, Jerry. London in the Nineteenth Century: "A Human Awful Wonder of God." London: Cape, 2007. Print.